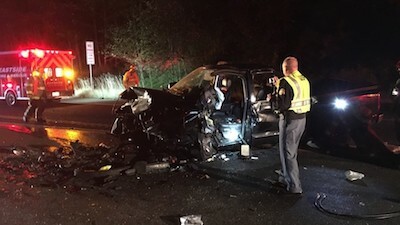 Four people were reportedly ejected from a vehicle – two of which were killed – in an overnight head-on collision on State Route 164 near Enumclaw Tuesday. According to KIRO7 News, a Kia passenger car was headed westbound on SR 164 when it lost control and crossed the centerline. The Kia crashed into an eastbound pickup truck driven by an unidentified man. All four of the Kia’s occupants were reportedly ejected from the vehicle due to the high-speed impact, two of whom were pronounced dead at the scene. The other two occupants were taken to a nearby hospital via ambulance, and their medical condition was unclear. Police are continuing to investigate the scene and determine all possible contributing factors to this deadly crash. Investigators have not yet determined if drugs or alcohol were involved, and the roads were reportedly icy in the area. When two or more vehicles traveling in opposite directions collide head-on, it usually means that at least one of the vehicles involved in the crash crossed the centerline and entered the opposite lane of travel. In some situations, more than one vehicle can be found to have crossed the centerline, which would complicate matters. Police indicated to reporters that they believed the Kia was the “causing vehicle” in this incident, which would make sense considering news reports indicated that the Kia crossed the centerline and struck the pickup truck head-on in its own lane. Despite these initial reports, a thorough investigation is still necessary to identify any other contributing causes. A police report will certainly be helpful in this process, but it can sometimes be necessary to have an independent third-party investigate the scene, especially if an injured victim or loved one is considering pursuing a personal injury claim or lawsuit. The award-winning auto accident attorneys at Davis Law Group will review your potential auto accident case for free to help you better understand your legal rights and options. If we believe we can assist you with your case, we will offer a free legal consultation to meet with you and further discuss the details of your claim. Call our office in Seattle at (206) 727-4000 or use the confidential contact form on this page to have your case personally reviewed by our experienced legal team. We work on a contingency fee basis, so there are no up-front costs and you only pay attorney’s fees once we have successfully resolved your case.